In one hand he had his cell phone, with mom on the line for shopping advice. In the other hand was a handout with a Westville rabbi’s admonition against crossing a picket line to buy food for the Feast of Freedom. His basket was empty. 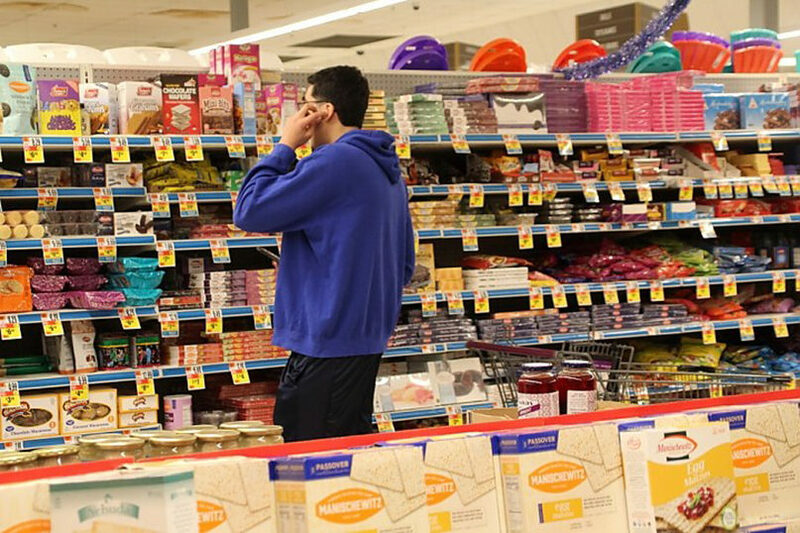 There David stood amid walls of macaroons, white fish, and grape juice in Aisle 13 of the Amity Stop & Shop, pondering the fifth question added to this year’s traditional Passover four questions: To buy? Or not to buy? David (pictured above), a Jewish Amity High School student, found himself in that predicament Monday, April 8, the fifth day of a New England-wide strike by 31,000 Stop & Shop workers represented by the United Food and Commercial Workers (UFCW). Strikers say they are seeking to halt pension and health care rollbacks, bonuses rather than salary increases and and the elimination of time-and-a-half pay on Sundays. Then there is also the slow phase-out of human workers with automated services like Marty, the new in-store roving robot. Management says it’s offering a pay increase and still offering health and pension benefits that exceed industry averages. The Amity store was technically open, manned by replacement workers, though David was the only customer in the aisle, which would normally be crammed in the days before Passover. 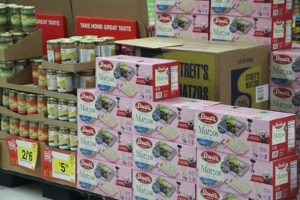 The Stop & Shop strike has posed an ethical issue for many New Haven and Woodbridge Jews who rely on the Amity store to purchase kosher-for-Passover groceries — and who in general who see union support, or at least not crossing a picket line, as an aspect of Judaism’s social justice teachings and imperatives. Few cars were in the Amity parking lot Monday morning. Picketers stood outside the entrance. As David went inside, a picketer handed him a photocopied flyer quoting Rabbi Jon-Jay Tilsen of Westville’s Congregation Beth El Keser Israel. David (he preferred not to give his last name) placed the flyer in his basket and then went about his shopping business. In the aisle, when a reporter asked him if he was aware of the strike issues or had read the flyer, he said no. He was the phone with his mother taking her directions as to what items to buy. He didn’t want to speak further. But he was open to a reporter’s suggestion that he read the flyer. He politely said he would and continued shopping and coordinating with his mom on the phone, shortly before a store manager politely but firmly asked the Independent not to take any more pictures. Later, as he walked out of the store, David declared to the picketers that he had not bought anything. He said he had read the flyer with rabbinical opinion and thought about things. “I felt bad,” he said. Unlike the Amity store, the Whalley Stop & Shop, at Orchard Street in the Dwight neighborhood, has been closed since Thursday and remains closed except for the Peoples Bank in the lobby. Strike captain Denise Tartaglia confirmed that before the walkout Passover supplies at the Whalley store, too, had also been stocked. Employees are keeping their regular hours of work, only putting them in on the strike line. They said since they’ve been out, there have been no conversations at their Whalley location about, for example, where else to get Passover supplies. Adrienne Fowler, who has worked at Stop & Shop for 27 years before retiring. She recently returned to work at the store, she said, because she enjoys working with customers. That’s a lot of Passover matzah, as well. I am not making any judgment about the current strike—whether the workers or owners are “right” or not, or whether or not they are smart or stupid. I am stating that we, local Jews, must respect the workers’ action. There are also applicable sources from the Rambam in Hilkhot Avadim and Hilkhot Sekhirut, if you accept the proposition that obligations concerning a non-Hebrew slave should apply to a wage laborer. The reasoning is straightforward. (A) Workers have a well-established right to organize and strike; (B) it is prohibited to cross a picket line, to utilize the services of scab workers, or to otherwise be involved in a labor dispute in a way that threatens the livelihood of the workers; (C) it is prohibited to use matza or other foods acquired illicitly (such as by crossing a picket line) for the mitzvot of Pesah, or at all. On (A) the right to strike, see the story from the Talmud in Yoma 88a concerning Beit Garmu. On (B) the prohibition of crossing a picket line, common sources are based on Makkot 24a, on “…lo asa le-re`eihu ra`a…” and Sanh 81a Rav Aha b’R Hanina, ” ‘ve-et eshet re`ehu lo timm’e ’—she-lo yarad le’umanut havero.” Here too modern posqim have written on this subject—respecting a picket line—quite directly. On (C), the status of food procured in violation of a labor action, see the extensive literature on “ha-mitzva ha-ba’a be-avera” or “ha-ma`ase ha-ba be-avera”—one nice essay at https://thetorah.com/moral-quandary-of-lulav-hagazul/ . Even if one believes that crossing a picket line is not technically illegal but merely unethical or reprehensible, as a local rabbi I have no choice but to advise the community that we may not use matza or other foods acquired by crossing a picket line to fulfill the mitzvot of Pesah, or at all. Although we merely left Mitsrayim and did not liberate it for the sake of all slaves, we are enjoined to not treat the labor of others as the Egyptians treated ours. Some kashrut agencies choose a narrow definition of “kosher” – they are certifying only that certain technical aspects of food production and provenance comply with the rules – which is a reasonable position. Here, I am simply saying that there are additional considerations that render food acceptable or not, and in this case, crossing a picket line, it is clear to us that the food is tainted. Apparently some contemporaries have said that while it is prohibited to work as a scab, it is not prohibited for a shopper to cross a picket line. It is the scab who is stealing the job, not the shopper who buys from the scab. It seems to me, though, that both scab and buyer are required for the harm to occur and that both are responsible. Structurally such arguments occur throughout the law, whether in the realm of partial or completed actions that violate Shabbat rules or directly in the realm of commerce. If we follow the technical leniencies in that logic, we can violate most of the Shabbat rules as long as we do them in teams or in small increments. 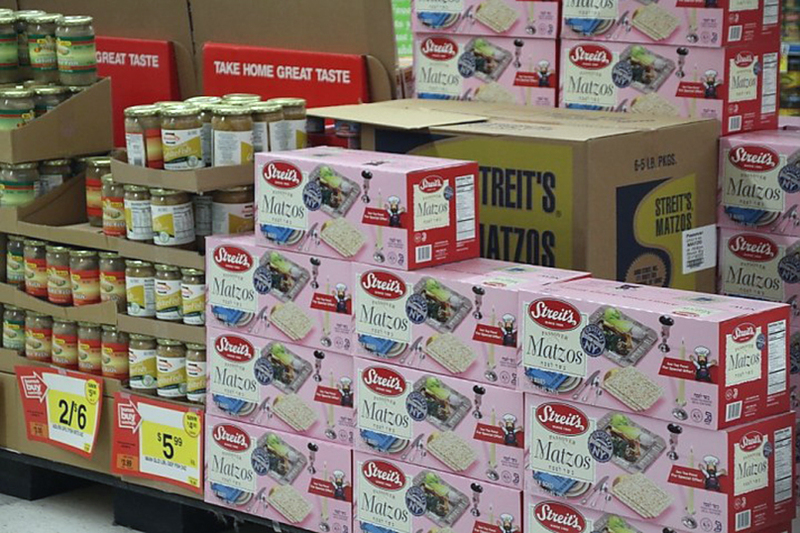 Even if one believes that only the scab is prohibited from crossing the picket line, the moral taint on the product, “ma-`ase ha-ba be-avera – something derived from a transgression” renders the product unusable, especially for a specific mitzva such as matza, marror or a feast on Pesah. This is the general rule, and it does not require that one be sympathetic to the workers or not. Other considerations would come into play were it a matter of public safety such as firefighters, or public workers such as trash collectors, which are not relevant to this case. In Greater New Haven, there are multiple sources of specialty kosher for Pesah foods, beginning right across the street from Stop & Shop at “The Westville Kosher Market.” The strike could not be at a worse time for my household. Although I don’t need any of the specialty Pesah products (having acquired them already), I will have to replace my home delivery of produce with one or two trips to other stores, which will add three hours of effort just when I don’t need it. In general, my neighbors seem to appreciative and prefer the Amity Stop n Shop, as it has the largest selection of kosher products year-round and at Pesah. For some of our households, finding groceries elsewhere is a hardship as they normally either walk or rely on public transportation, and removing the closest stores vastly increases the time or expense in acquiring groceries. This is a problem faced by many Americans, though only a small number of Greater New Haven Jews. The harder question of law—which is not clearly established—is whether and how these rules, which developed for application within a Jewish community, apply to us in the context of a Diaspora locale in which Jews are a minority. Without having to judge the status of the particular corporate owner or the proportion of Jewish workers in the union, I think the laws will have to apply either as developed historically for Jewish communities, or under the parallel set of “Mipnei Darkhei Shalom” statutes given that crossing a picket line is considered, locally, by many (and whether correctly or not may not matter) to be unethical or morally reprehensible. That is to say, that the existing sociological condition in New Haven, namely that the broad public, Jewish and not Jewish, view crossing a picket line as unethical, may be a reason by itself for Jews to not cross a picket line, absent some greater concern. The image of “everyone” in the New Haven community respecting the picket line, except for those visibly recognizable as Jews, would be quite disturbing. This article is excerpted from an article that appeared in New Haven Independent and is reprinted here with permission. To read the full article, visit www.newhavenindependent.org.